Bactol Alcohol Gel is a waterless, alcohol based antibacterial hand cleanser that uses natural Macadamia Nut Oil to replenish the skin. It has been specially formulated with a natural emollient to replace the skin's lipids which are removed by alcohol. This antibacterial hand rub helps maintain skin integrity and prevents moisture loss leaving your hands hygienic, soft and replenished. or bed mounted at the point of care. 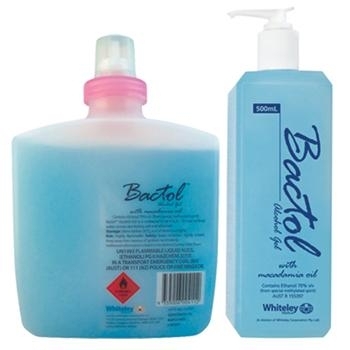 Stop the transmission of infection with Bactol Alcohol Gel Antibacterial Hand Cleanser. Human skin lipids contain approximately 22% of cishexadec - 6-enoic acid which along with palmitic acid comprise around half the skin lipid content. It’s action is thought to be a combination of lubrication, softening and protection of the protein structures and prevention of moisture loss from the skin. Macadamia Nut Oil contains up to 22% of an isomer, palmitoleic acid which is the highest known actual concentration of this unique material. Bactol Alcohol Gel has been developed in compliance with EN1500 testing standard for alcohol based hand rubs. It is formulated with an alcohol concentration of 70% Ethanol v/v, as recommended by WHO for maximum efficacy. Click here for Bactol Alcohol Gel MSDS.